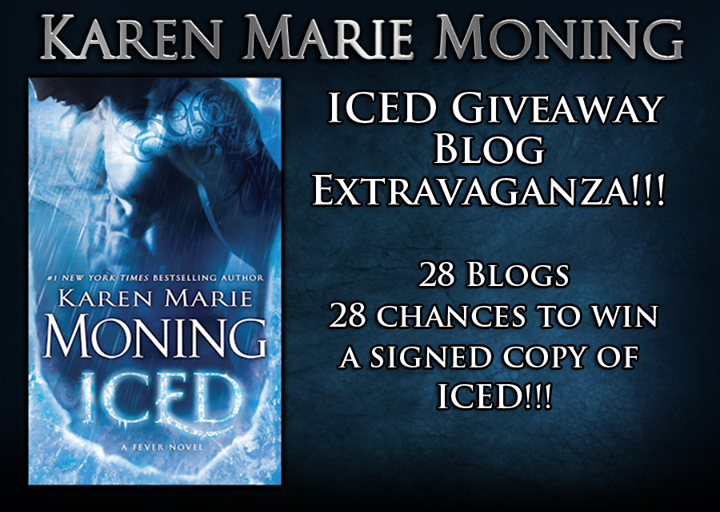 CONGRATULATIONS Karen Marie Moning! On your very special release day! Today, February 25, 2014, “Iced” was release on paperback after over a year of its hardcover release. I am so excited to be sharing this wonderful giveaway with all of you, as Karen and her Fever Series, as well as the Highlander Series holds a special place in my heart. In the Spring/Summer of 2012 I got back into reading. I wasn’t a big reader prior to that but I still loved and collected books. After a startling revelation my cousin recommended this series to me and let me tell you IT CHANGED MY LIFE! ENTER my giveaway – open internationally because I’m super awesome (even though shipping is expensive :P) and add this WONDERFUL book by this WONDERFUL author to your collection. Iced is the first book in the Dani O’Malley series and sixth book in the Fever series. It will be followed by Burned – to be released in January 2015, and Flayed – TBA. Giveaway ends Monday, March 3rd at 12:00am EST. Great series! I’m looking forward to Burned! Omg me me me me!!!!!!!!! i love shadow fever it’s the holy grail of ALL books hands down and no one will ever tell me any different! Jericho Barrons will always and forever be my #1 bbf. Flipping love KMM!!!! I can’t wait for burned release! I love KMM’s work! Both the Highlander and Fae Fever series. Favorite book so far is Shadowfever! & my favorite character will forever be BARRONS! My favorite book is Shadow fever. Any of the Fever series are my favorite. They are all amazing. My favorite character is Mac. Favorite book is Shadow Fever and fav characters are Jericho and Mac. Can’t have one with out the other! Dying to read this book!!! Loved the Fever Series! Can’t wait to see what happens to Dani! It's insane how much I can obsess about Karen Marie Moning's books and characters. I must quote you: this series changed my life. It surely changed my standards about book-boyfriends. Thanks for the GA, I'm from Italy so DOUBLE thanks for the international GA! Yup, you're certainly made of awesomeness. I love this series! I’ve read it at least 4 times. I don’t know how people can wait a whole year to read them. This is my favorite series ever ! I love KMM and JZB is my favorite character of all times ! Would love to win KKM is one of my favorite authors & Fever is my favorite series! Shadowfever is my favorite book in the series. My fav has got to be Dani. I mean, dude, she says “dude”. I haven’t read the series yet.. But I can’t wait to star reading one this summer! I love very single book! From the moment Mac finds out her sister is dead to the end of Shadowfever it was the best damn series! I loved Mac, JZB, Dani, and Christian! Gahh…KMM is phenomenal!!! If I had to choose, my favorite book of the series is Shadowfever and I love Mac!